Ice cream is always a good idea. It’s perfect in the summer time to beat the heat, but it’s also a good way to end a night in during the winter. There are so many different ice cream companies out there that finding your favorite flavor can be like finding a needle in a haystack. 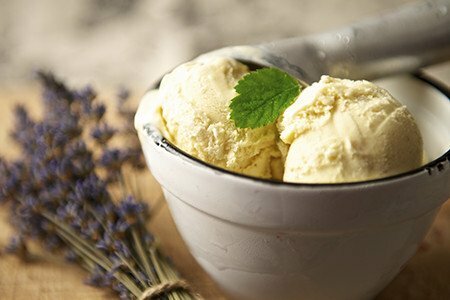 Rather than searching through flavor after flavor at the store, why not try to make ice cream on your own? This is one of the most basic methods to make ice cream at home. To start, fill a gallon sized plastic bag half-full of ice. Then, add in ½ cup of salt to the ice. This will help freeze your ice cream creation and create a fluffy, creamy texture. In a smaller plastic bag, mix a cup of half and half, 2 tablespoons of sugar, and your desired flavor. Seal the bag tightly and place it into your bag of ice. Seal the bag inside tightly and shake the two bags together. Continually shake the bag for around 10 minutes or until the texture is firm, like ice cream. Once you get the texture you desire, you’re ready to serve! It’s that simple. For a classic vanilla flavor, you can try adding a half teaspoon of vanilla extract. This way, you can serve your homemade ice cream with whatever toppings you like—fresh fruit, sprinkles, cookies—the possibilities are endless. If you are looking for a healthier, dairy free ice cream creation, try using frozen bananas and a food processor! Did you know that bananas make for the perfect ice cream base? Now you do! Toss a bunch of bananas into a food processor along with your favorite flavors—peanut butter, hazelnut spread, strawberries, blueberries—the possibilities are endless. Blend your mix together to instantly create ice cream! To make it a bit creamier, try adding in a dash of milk or almond milk. This is another simple method to create your own, homemade ice cream. Using heavy cream, condensed milk, and a bit of elbow grease, you can create your own delicious ice cream. This method lets your freezer do all the work so you can get out and do all of the things you have on your to-do list and come home to a freezer full of delicious ice cream. Start by pouring heavy cream into a large mixing bowl. Whip your cream using a whisk or a hand mixer. Once the heavy cream is completely whipped, pour in sweetened condensed milk. Once the whipped cream and the condensed milk are completely mixed together, place in the freezer. This mixture will take about 5-8 hours to freeze completely. Make it at night and let it freeze overnight! You’ll wake up to a delicious frozen treat that you can customize to make completely your own.